It didn't serve Migos well, going after Big Sean instead of before. Then again, they didn't seem themselves, anyway. Migos' crew took up the entire stage as they began their set, and tried to hype the crowd with "One Time," but it felt strangely lacking energy compared to Sean's stormy appearance, especially given the trio's penchant for speedy, energetic delivery. Certainly, their good moods were infectious, but it had more of a relaxing effect on the crowd than a galvanizing one. Unfortunately, the audience seemed more into the t-shirts their crew were throwing into the audience than the music, and oddly half-baked versions of "Fight Night," "Hannah Montana" and "Freak No More" didn't do enough to win them back. 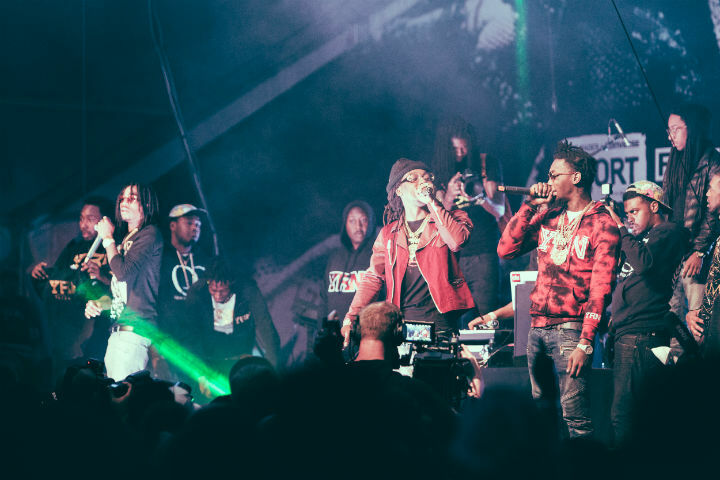 By the trio's last song, "Hit 'Em," during which their whole posse came to the front of the stage, the audience was finally engaged, but Migos left immediately afterward. That's a good thing; like seasoned showmen, Migos left the stage on a high. But it wasn't enough to make up for the rest of their weirdly disjointed and lackadaisical Fader Fort set.